Trees Are Connected To Their Environment. Their growth patterns are in response to the forces around them. Their symbiotic relationships with other organisms allow them to thrive, sometimes in the most difficult conditions. Their strategies for survival are simple, subtle and logical. Human mistakes made at any one step of a tree's development can result in a less healthy, shorter lived tree with a higher maintenance cost, and one which fails to attain its intended aesthetic and functional contributions. Because most reasons for tree failures are due to human error, most can be prevented through knowledge. PEST PROBLEMS- Healthy Trees do not generally have serious pest problems. Stressed trees are attractive hosts to insects and pathogens, which can contribute to further decline and eventual death. Poor gas exchange resulting from soil compaction can be mitigated by a number of treatments. These methods include the use of an Augur, Water Jet, or Pheumatic (Air) Excavation. Mulching around trees to limit weed competition and soil compaction can help improve tree health and restore vigor. OVER WATERING- The most common problem we see with newly planted trees and shrubs is the application of too much water. When soil conditions are saturated, oxygen is pushed out and roots become non-functional. It is critical that one understands how much water plants require and how much water is being applied. This involves conducting a water audit and careful moisture monitoring (before and after irrigation) with the use of a hand auger. Check out a video of one of our soil investigations here. IRRIGATING DURING DROUGHT - For established trees that have traditionally been receiving water, roots are likely located close to the surface; there has been no need for them to develop lower in search for water. It is important that when becoming more water wise, irrigation not be suddenly abandoned adjacent to these trees. They lack the root system to make it on their own. Instead, a transition should be provided, watering less frequently but deeply so that roots can develop deeper in the soil profile. The formula provided below helps to determine the amount of water necessary to wet the soil profile down to 3 feet, based on a 100 square foot area. Determine the square footage of the area you would like to irrigate, and plug it in to the formula. Remember, apply irrigation slowly to minimize run off. - Surface Area: Area is 10' x 10' or 100 square feet. -Depth to which water is to be applied: 3 feet. -Soil volume of the area: 100 sq feet multiplied by 3 feet deep is 300 cubic feet, wetted to field capacity. FERTILIZATION- Other than the use of Good Quality Compost, no fertilization supplying primary nutrients and micro-nutrients is recommended without prior soil and leaf tissue analysis. Excessive nitrogen fertilization is known to draw sucking insects (aphids, scale, etc.) to the plants and provide nutrition to fungal pathogens in the soil. TREE PROTECTION DURING CONSTRUCTION- The goal of tree protection and preservation guidelines is to provide for a successful transition for the tree(s) within a modified site. In truth, the majority of tree protection has failed. This is primarily due to slack specifications for protection and lack of proper enforcement. Murphy's Law seems ever present when heavy equipment and trees are in close proximity. It is often the case that construction related tree death occurs a number of years after the project has been completed. Establishing a bond equal to the value of the tree prior to beginning work is helpful for contractor accountability. 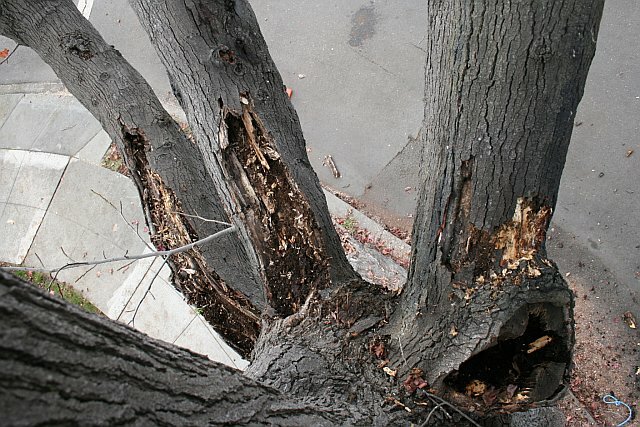 SBCA Tree Consulting provides tree protection guidelines and tree valuations. TREE HAZARDS- Trees are dynamic organisms and therefore it is impossible to fully predict when they can no longer remain in the Urban Forest for safety reasons. However, there are effective standards and methods that arborists use today which are helpful in the assessment of tree safety. Understanding the qualities which make trees hazardous and at what levels problems can be allowed to exist are both critical for management, liability and to assure that valuable trees are not needlessly removed. Photo above left - Sun burn damage (sunscald), a result of over pruning, has compromised this American Sweet Gum (Liquidambar styraciflua). Often times tree hazards are not visible from the street below, as was in this case. Regular aerial inspections are recommended for large, mature trees, especially if they have endured innapropriate pruning in the past. Photo above right - The soil auger is an arborist's most useful tool, as it provides valuable information as to what is going on in the soil enviornment below. This newly installed landscape was receiving too much water. Saturated soil conditions are problematic due to limited soil gas exchange and proliferation of fungal pathogens. Careful soil moisture monitoring is required until irrigation application is optimized.